advice." -Stephen M. R. Covey, author of The Speed of Trust If you think the only ones who need to concentrate on presentation skills are professional speakers, it's time to reevaluate your perspective. Whether or not you are trying to speak in front of an audience, close a sale, or ace a job interview, you need to forge connections that last. This starts with presenting yourself as intelligent, successful, and likable. Written by two expert public speakers, this guidebook delivers â€¢ proven tips, tools, and strategies to get your message across in a lively manner; â€¢ fifteen ways to keep your audience awake and energized; â€¢ guides to using humor, stories, and anecdotes to make your talk more interesting; â€¢ twelve ways to instantly improve your slideshow presentations; â€¢ many more proven techniques to increase audience engagement. Whether you are speaking at a conference, staff meeting, or interview, you need a roadmap to come across as a winner. Enjoy the peace of mind that comes from knowing that you will be ready to master any presenta-tion situation. 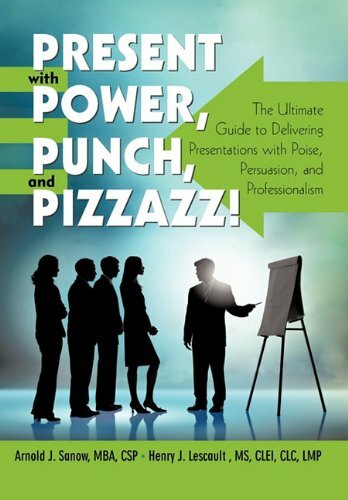 Learn how to Present with Power, Punch, and Pizzazz!